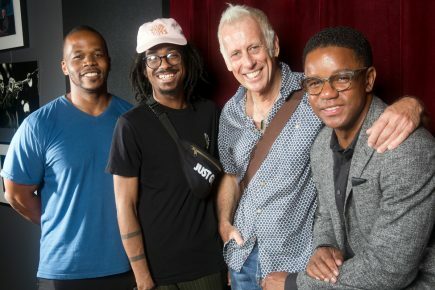 Above (left to right): Warren Wolf, Joel Ross, Joe Locke, and Stefon Harris at the Jazz Gallery, New York City, Aug. 10, 2018. Photo by Alan Nahigian. 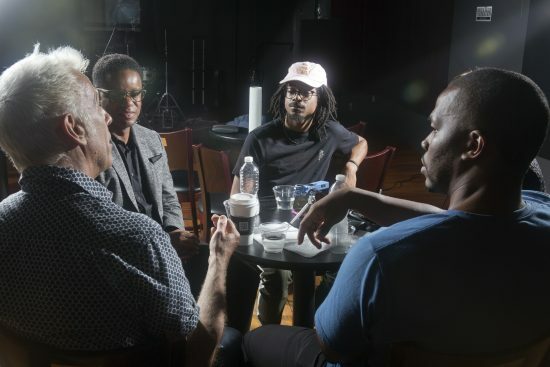 On a hot August day they gathered at the Jazz Gallery club in New York City: four of jazz’s foremost vibraphonists—Stefon Harris, Joe Locke, Joel Ross, and Warren Wolf—who had agreed to sit down together with JazzTimes and discuss the state of their instrument (along with whatever else was on their minds). Three of the four came into this summit with soon-to-be-released albums. Harris says Sonic Creed, his September release with his band Blackout, “is about paying tribute to the cultural values associated with this art form.” It’s his first album as a leader in nine years. Nowadays, Harris spends a lot more time on campus than in the recording studio; he’s the associate dean and director of jazz arts at the Manhattan School of Music, and his other academic credentials include leading curriculum development at the University of the Pacific’s Brubeck Institute—where Ross was one of his students—and co-founding the Melodic Progression Institute, which has developed an ear-training app called Harmony Cloud. Locke’s album, Subtle Disguise, is out this month. He says its title track “is about the ways that we hide ourselves from one another—the masks that we wear.” He also notes that the title track is a disguised version of an old Miles Davis tune, adding, “I don’t mention in the liner notes what that is. It’ll be interesting to see what people think that song is.” He’s a member of Harris’ faculty at the Manhattan School of Music, as well as a visiting professor at London’s Royal Academy of Music. Wolf—who plays in a duo with Locke in addition to his work as a leader—released his latest solo album, Convergence, in 2016. He’s now thinking about his next one, which he expects will take him in a different musical direction. “The plan is to do a record more in the Roy Ayers style,” he says. “Not when Roy was swinging more, but more in when he was doing his pop and soul fusion/R&B groove.” Wolf teaches at the San Francisco Conservatory of Music, Temple University in Philadelphia, and the Peabody Conservatory in Baltimore. Most important, Harris, Locke, Ross, and Wolf are all friends who clearly hold one another in high regard as musicians and as people, and their camaraderie was palpable. (Dare we say there were great vibes?) 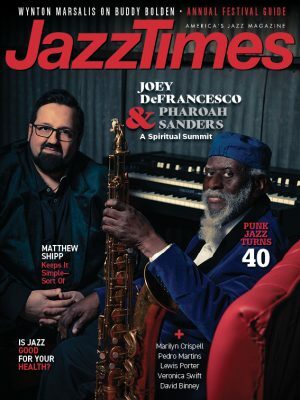 When JazzTimes arrived at the club, Harris was already there playing the piano onstage, and as the others arrived they immediately gathered around him. Everyone eventually settled around a small table for a wide-ranging conversation in which they swapped stories, bantered with each other, grew reflective about their lives and work, and shared a lot of laughs—only some of which were at the expense of glockenspiel players. This discussion has been edited for length. 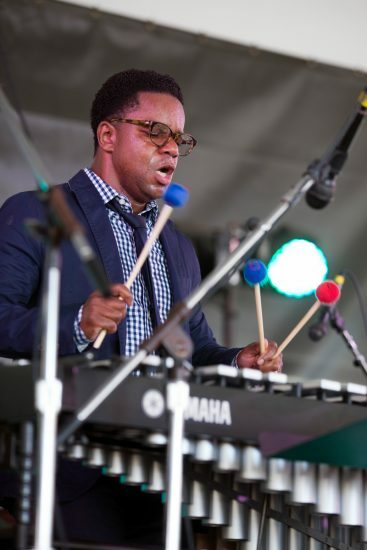 JazzTimes: How did you come to choose the vibraphone? HARRIS: Most of us did not come to the vibraphone from percussion. We all come from the piano. I have a background in classical percussion but I started at the piano, and probably 90 percent of the time that I spend working on music, it’s at the piano, not at the vibraphone. LOCKE: It’s the same for me. I think of the instrument definitely being in the piano family. I always say that someone who plays the piano has a better chance of speaking on the instrument quickly than someone who comes from drums. When you’re composing or arranging, how do you envision the vibraphone? Do you first think of it as carrying the melody? Do you think of it as a rhythm instrument? Do you let it organically happen? ROSS: When I’m composing specifically for an ensemble, I’m not really thinking of what the instrument is going to do. I might start off thinking of a melody, but I’m never thinking, “Oh, the vibraphone will do thisat this point in time.” It’s either melody, harmony, rhythm—whatever comes first. LOCKE: I always write at the piano. Of the hundreds of pieces that I’ve written, maybe two or three were composed at the vibraphone. Same as Joel, usually it starts with an idea, an emotion, a feeling inspired by a phrase or something that made me want to sit at the piano, and [I’ll] just sit and some chords will come, and a melody will grow from that. WOLF: I can say sometimes my writing … maybe it won’t come from the piano. The majority of the time it does, but sometimes you never know—you could be sitting at a set of drums and have some rhythm going on. So while you’re playing your beat at the drums, you’re sitting there thinking, like, “Hmm, what bassline can come under this?” [The others assent] And from the drums, you build from the bottom up to the top. HARRIS: The other thing I would add to that is that essentially the vibraphone is a tool. It’s a bunch of metal and wood used to manifest an artist’s individual expression. So although we may not be thinking specifically about the vibraphone when we’re writing, we’re probably expressing our authentic voices, which are most naturally expressed, I think in most of our cases, through the vibraphone. Did you have vibraphone heroes? WOLF: My first hero was my father. Warren Wolf, Sr. [All laugh] I’m the junior. Although we don’t go by that. He was the first person that I’ve seen play the instrument. And after that, when we started looking at old videos, I think Milt Jackson was first, followed by Lionel Hampton, and then so forth. HARRIS: If you ask me who my heroes were, most of the people I’m going to name are people I had direct interaction with. So my first artistic hero would have been the black church. My mother’s a Pentecostal minister, so my first exposure to the role of art in society, in terms of amplifying people’s individual narratives, was in the black church. And then I met someone in classical music who became a mentor for me. His name is Richard Albagli [percussionist for the Albany Symphony Orchestra and conductor of the Empire State Youth Orchestra], and he’s an absolute genius who took me in and did for me what was the most important thing for me as an eighth-grader, and that was treat me as an individual. Because in this society, being an African-American, many times I find myself being prejudged. This guy said, “I see something really special in you. I’m going to dedicate the next five years of my life to helping you realize your potential.” And he challenged me in ways that no one else had ever challenged me in my entire life. I really didn’t hear the vibraphone much until I got to college and someone started to show me some jazz records. I heard Charlie Parker for the first time, and there was this amazing record with Milt Jackson and Cannonball Adderley. It’s called Things Are Getting Better [Riverside, 1959]. And that record completely changed my life. LOCKE: I started playing drums when I was a little boy, and my mother, who was very smart—she was not a professional musician, but she said to me, “If you’re going to play drums, I’ll get you a drum set, but you have to take piano lessons.” So I took lessons with her, because she could sight-read music at the piano. And she wanted me to play the glockenspiel in the marching band, because I guess she was a sadist or something. [All laugh] Because the glockenspiel player in the marching band was who the nerds beat up after school! She came into my room one day and she said, “Joe, I saw an ad in the want ads for something called a vibraphone. I think that’s like a glockenspiel. Let’s go have a look at it.” And we bought this vibraphone. It was a Jenco vibraphone for $400, and it sat in my room for a year. And one boring rainy Saturday when none of my friends were around and there was nothing on TV and I had clothes piled on top of this Jenco vibraphone—dirty clothes and books—I was so bored, I said, “Let me take this stuff off this instrument and see what’s—” and that was the beginning for me. I didn’t realize that that boring, rainy Saturday afternoon was going to change the whole path of my life. HARRIS: That’s deep. He remembers the day. HARRIS: And now that you say that out loud, I even remember the day that I first connected with a mallet instrument. I taught myself to read music when I was six, so when I went to school, I could read already. I was more advanced than the other students, so the teachers would just keep giving me instruments. I played all the band instruments: clarinet and trombone. I played string bass in the orchestra in middle school. And I remember walking into the band room in seventh grade … and there was this marimba in the back of the room. And it had a cover on it, and I uncovered this thing and picked up some mallets and started hitting it, and pretty quickly I just felt physically connected to it. I don’t know why, but I was able to absorb the technical requirements of playing that instrument faster than any other instrument. It’s almost like it was waiting for you to find it. Joel, how did you start out? ROSS: I have a twin brother and we both started out playing drums when we were about two or three years old. My father led the choir at church, and we listened to music at home. One of my brother’s godparents played drums at church, and so we would go sit up in the front pew and just watch him play. That was the beginning of us getting into playing drums. We went to elementary school, where we first joined band. We were in percussion, and my brother made me play the mallet instruments, because he didn’t want to. Because he’s the older twin! [The others laugh] That’s why I learned how to read. That’s why I learned how to play xylophone, marimba, also timpani—although he would steal that too, because it was a drum. I definitely was only doing the mallet instruments. I learned to play the glockenspiel and everything. ROSS: Once we started the elementary school concert band, we auditioned for the All-City concert band and we got into that program. But they also suggested we try for the jazz band. We both auditioned on drums. My brother got in—he was the better drummer. And they told me to audition on vibes because I knew how to play xylophone, I knew my scales and chords, and that’s all they needed to start with 10-year-olds. 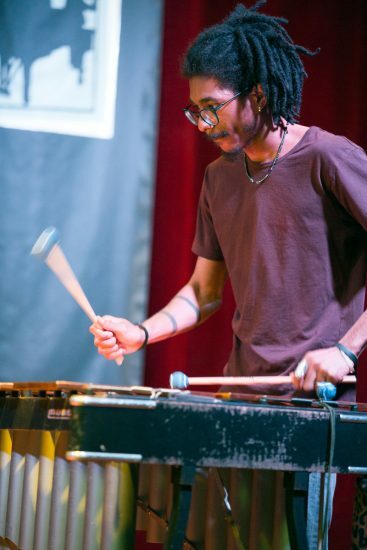 I didn’t want to do it, but my father was like, “You’re going to play the vibraphone because that’s going to be your ticket”—or something along those lines. Since we’ve now had multiple references to glockenspiels, does everybody here have experience in marching bands or percussion ensembles? HARRIS: I played trombone and sousaphone in the marching band. But I did play in classical percussion ensembles in college and in high school. Did that affect your approach to your instrument? HARRIS: Studying classical music did help me a lot with regard to phrasing. Because in classical music, the momentum of the music is generally driven by the melody, whereas a lot of times in other art forms—particularly art forms derived from African culture—it’s driven by rhythm. I spent years focusing on arias and learning how to phrase. When I did come around to focusing on jazz, I was pretty good at phrasing, and it was more about backwards-mapping into rhythm, which wasn’t foreign for me because I grew up in the black church. 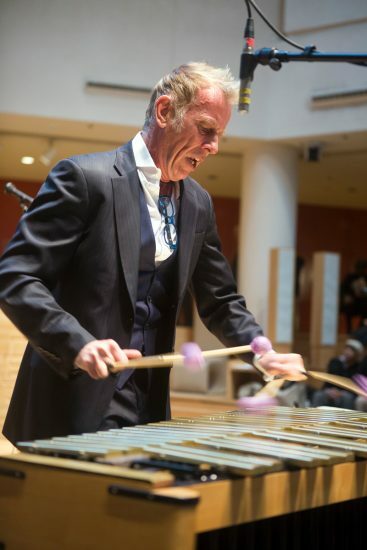 I also have to mention that I studied with Joe Locke when I was in college. When I came to New York I was running around asking everybody to help me, and a lot of other people were like, “Yeah, kid, whatever, I don’t have time.” Joe said, “Come by the house.” And he opened up his CD collection. He has stacks and stacks of notebooks. [To Locke] I’m telling your business, brother! [Locke laughs] Stacks and stacks of notebooks, a deep dive into the world of harmony that he never hesitated to open up and share with me. So you talk about heroes—this is one of mine right now, sitting right there. 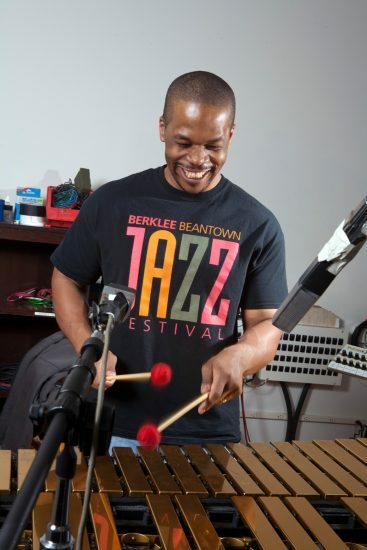 When you decided that you wanted to be a jazz musician and play vibraphone, how did you envision that career? Did you see yourself as a bandleader? Did you see yourself as a member of an ensemble? ROSS: I’m still figuring that out [laughs]. ROSS: I definitely have fallen in love with composing. I love to perform because I also love to connect with other musicians and other players—singers, anything. I like to perform, but I have a preference to compose, which does not have to include me being a part of the performance. HARRIS: I have lots of notebooks where I write down thoughts. And years ago I wrote in one of my notebooks, “I am not a musician. I have a gift, which happens to manifest itself well in music.” So I started to backwards-map from there to figure out what is my actual gift. I don’t have perfect pitch and perfect rhythm and all that stuff. I think my gift has always been for communication. And once I started to zero in on that—and that’s one element of it—I gave myself permission to begin to dream off the bandstand. I started to do things like give presentations in corporate America. I created an app company. I’m now the dean of the jazz department at Manhattan School of Music. So my perspective on my career became much broader when I started to not think so one-dimensionally about the career path of being a musician. Everybody here is involved in teaching to some degree. Do you teach only vibraphone or do you range farther? WOLF: I probably can speak for most of us. We probably have a few vibraphone students, actual, in school, but you never know. It could be ensembles. It could be guitar players—whoever wants to learn about the music in general. It’s not necessarily about the instrument. What’s the most important thing that you want to impart to these students about the life of a professional musician—and what are you learning from them about what it takes to be one? ROSS: I’ve only started giving a few lessons to some cats, and I already know that what I want them to take away the most from whatever I can tell them is how to attain their own personal understanding of whatever information I give them, so that they can use whatever I give them to express themselvescompletely. The other thing that I think is really important to share: Sometimes I see students who seem—because they’re maybe more gifted, maybe they have a sense of entitlement—that “I’m anointed because I’m so talented.” And I look at that and I say, “Man, if you are more gifted than another student, hold the door [gets emotional].” And I get choked up even talking about it—because it’s your responsibility, if you’re more gifted or talented, to hold the door for the brother or sister that’s struggling a little bit. Do you have people coming up to you asking about how to get into the business or how to play something?